From July 1976: British Marvel's THE MIGHTY WORLD OF MARVEL weekly celebrates 200 issues in print. The black & white anthology, launched in 1972, started life as a vehicle for heavy hitters Hulk, Spider-man and the Fantastic Four in a plan to raise the characters UK profiles in the hope of shifting more copies of the imported US comics. Early success meant that plans changed and the line expanded to become a fully-fledged operation, albeit largely planned and managed out of the New York Bullpen. MWOM has a bit of a reputation - with justification - for being a vehicle for characters (with the exception of the Green Goliath, who became the title's anchor star) who had performed less well elsewhere. A succession of mergers saw the likes of FURY, PLANET OF THE APES and DRACULA LIVES (as well as a humbled FF) pop up in its pages. By issue 200, the line-up consisted of the Hulk, the Avengers (previously stars of their own fairly successful weekly) and Conan (star of a less successful weekly who enjoyed greater success in the back of the Avengers comic). 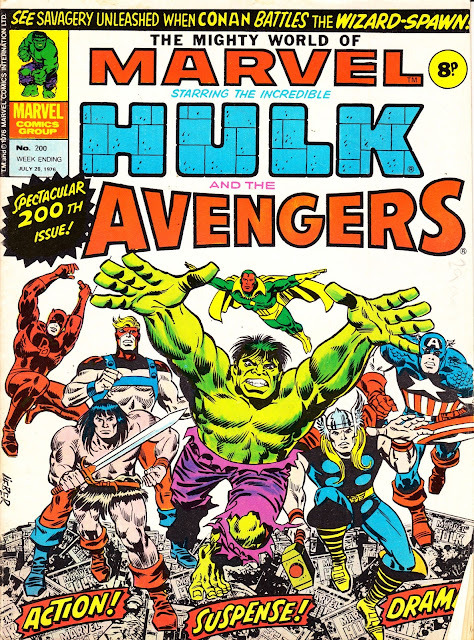 The latter two had both crossed over from the collapse of The Avengers comic, cementing a weird partnership which also extended into the British annuals. As this was the first Marvel UK launch, it was also the first to celebrate this milestone. As the decade dragged on, the Bullpen found it harder-and-harder to keep subsequent titles in business for any length of time. Hatch-match-dispatch became the order of the day. Not even the runaway success of STAR WARS came close, thanks to a frequency change after 1980 and a reboot - with a new issue one - in 1983. MWOM soldiered on, probably bolstered by wave of refugee readers from defunct titles, until January 1979 when it was radically retooled as MARVEL COMIC. Which didn't last long. The masthead returned in the Eighties (albeit for less than two years) and has enjoyed an extended run as part of the Panini line. It's almost surprising that Marvel have never adopted the brand in the States. That's a very happy Hulk. Hulk may smash you for saying such things. I don't seem to recall a team-up between Conan and the avengers but you never know.